George Ewing Ingles was born on May 28, 1865 in or near Dunbar or Pennsville, Fayette County, PA the son of Jacob and Sarah (Minerd) Ingles. George's parents separated when he was about two years of age, and the father -- a Civil War veteran -- spent the rest of his life roaming the nation, with a primary residence in Chicago and Milwaukee. In adulthood, George took on his step-father's name and went by "Ogle." By 1870, when George was age five, he and his mother and brother resided with a grandmother, Hester (Sisler) Minerd, in North Union Township, Fayette County. In about 1870, George's mother remarried to Civil War veteran William D. Ogle, a coal miner, and the family settled in Pennsville, Fayette County. The federal census of 1880, when George was age 15, shows him in the Ogle household but listed with the Ingles surname and described as a "step son." George is believed to have begun using the Ogle name for good between 1889 and 1900. When George was 24, still using the name "Ingles," he married 20-year-old Sarah Elizabeth Flack (1869-1939), the daughter of John F. and Mary (Rice) Flack, and a native of Bowen, Adams County, IL. The wedding took place on Feb. 11, 1889, at Mt. Pleasant, Westmoreland County, PA. At the time of marriage, George resided at Alice Mines near Mt. Pleasant. 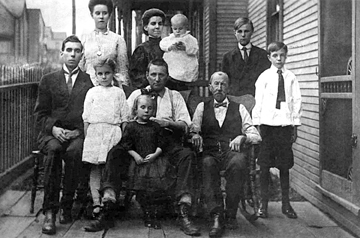 George and Sarah had seven children -- John William Ogle, Ida Mae McDowell, Ruth Miller, Chalmer Trustin Ogle, Albert Franklin "Happy" Ogle, Myrtle H. Stamford and Clarence Otis Ogle. There was a 20-year age difference between their eldest and youngest children. Sadly, George's mother died in 1890, of breast cancer, when he was 25. In about May 1893, when George was 28 years of age, he secured employiment as a store attendant/shipping clerk for the Pennsylvania Railroad in Pitcairn. He relocated the family to Pitcairn and they remained there for many years. Family lore says that George was a leader of the gandy dancers, a crew of men who laid and maintained steel rail track. He was so strong that he allegedly could drive a railroad spike into the ground with one blow. He is believed to have been a hard drinker, and Sarah is said to have been "a good Christian lady" who was a good cook but endured "a hard life." Tragedy rocked the family in 1895 when George's younger brother, William H. Ingles, was killed at the age of 28 in a coal mining accident. George tragically also lost his step-father and brother in law Charles Halfhill in coal mine mishaps. When the federal census was taken in 1900, George used the name "Ogle." He and Sarah and their four children, ages four months to 10 years, were living in Pitcairn. George was employed that year as a shipping clerk. Also residing in their home as a boarder was his younger half-brother, 30-year-old Albert H. Ogle, who was unmarried. In about 1909, George's father, who had been away for decades, and thought to have been estranged from the family, returned to Pitcairn. George's mother and step-father were dead, and thus the way may have been paved for the reuniting of this family -- grandfather, only surviving son and daughter in law, and seven grandchildren. In commemoration of this remarkable turn of events, the family posed for a photograph, presumably at the family home in Pitcairn in 1909. At the time of the photograph, Jacob was age 71, and his son George was 44, and the years of separation at that point had been 42 -- almost George's entire lifetime. Jacob would live another 11 years, but returned to Milwaukee to the National Home for Disabled Volunteer Soldiers, where he made his primary residence. In 1910, the census shows George and Sarah and their expanded family of now seven children in Pitcairn, with their home on Ninth Street. George made his living that year as a laborer in the railroad car shops. Another of their addresses over the years were Hillside Avenue (in a large house with many bedrooms, floors and a wrap-around parlor) during the period from 1934 to 1939. George retired from his work as a store clerk for the Pennsy in March 1932, having spent 38 years on the job. Sarah was felled by a cerebral hemorrhage on March 2, 1939 and died three weeks later on March 23, 1939. She was just 16 days shy of her 72nd birthday. George survived his wife by just a little more than seven months. He moved into the home of his daughter Myrtle at 114 Rear Shaw Avenue in Turtle Creek, Allegheny County. He suffered a stroke caused by hardening of the arteries and heart disease. He passed away in Turtle Creek on Nov. 7, 1939. He was 74 years of age. His son Chalmer provided information for the official certificate of death, and stated his father's parents as "Jacob Ogle" and "Sarah J. Minor." They are buried in Grandview Cemetery, the same cemetery as George's father. Grandfather Jacob Ingles, seated, right, reunites with son George (seated, center) and family. Seated, l-r: John W. Ogle, Myrtle H. Ogle, Ruth Ogle, George and Jacob. 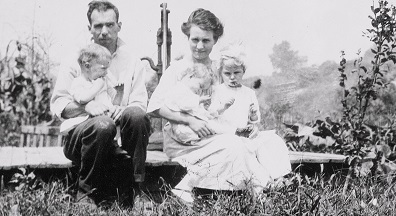 Back, l-r: Ida Mae Ogle, Sarah Ogle, baby Clarence Ogle, Chalmer T. Ogle, Albert "Happy" Ogle. Son John William Ogle (1889-1931) was born on Sept. 14, 1889 in Mount Pleasant, Westmoreland County, PA. He was of medium height and slender build, with grey eyes and brown hair. When he was 26 years of age, on March 16, 1915, he was joined in wedlock with 22-year-old Mary Mabel Mensch (1893-1972). The nuptials were held in Pitcairn. Mary was a native of Middletown in Hempfield Township, Westmoreland County, and the daughter of John and Emma (Heinze) Mensch of Pitcairn. The Ogles bore six daughters -- Audrey Beatrice Neal, Faith Coline Hartman, Ruth Erma Humphrey, Vera Dawn Brown, Bonnie Lovelle Happ and Mary Lucretia Whalen. Circa June 1917, with the United States being drawn into World War I, he registered for the military draft. He told the draft board officer that his job was as an air brake repairman for the Pennsylvania Railroad at Pitcairn. After the war, he also worked as a repairer of railroad cars. The federal census of 1920 shows the family living in Patton Township, Allegheny County, PA.
John later was self-employed in the coal transport business, known as "transfer and express" in the terminology of that time. In winters, he "trucked" coal and in summers he moved ice. He used a beautifully lettered sign, reading "J.W. Ogle Coal Transfer & Express," which is believed to have been affixed to his wagon. When suffering from heart problems in later age, John found employment as a tax collector for Pitcairn Borough. Mary may have assisted in this work. Their home was at 549 Third Street. He died on June 11, 1931, at the age of 41, having been plagued with chronic heart disease for four months. Burial was in Grandview Cemetery. Mary outlived her husband by more than four decades. In her final years, she moved to Long Beach, CA at the address of 1122 Walnut. She died there on Feb. 1, 1972. Rev. Edward Ray officiated at the funeral service. A death notice was printed in the Long Beach Independent, noting that her survivors included nine grandchildren in addition to her sisters Gertrude Houck and Lucretia Walker. Daughter Audrey Beatrice Ogle (1916-2005) was born on March 8, 1916 in Pitcairn. When she was 26 years of age, on Dec. 12, 1942, she married 37-year-old Thomas Hopkins Neal (Nov. 30, 1905-1991), a native of New York. The Neals produced one son. They resided in Baltimore, MD and then in Port Charlotte, FL. Said the Baltimore Sun, "Mrs. Neal worked as a secretary before retiring. She moved to the Port Charlotte area in 1968 from Baltimore, Md. Mrs. Neal was a member of St. James Episcopal Church and enjoyed working at the Charlotte-Glades Library System." Sadly, Thomas passed into eternity in Port Charlotte on Dec. 19, 1991. Audrey survived him by 14 years. She died in Port Charlotte on May 10, 2005. Daughter Faith Coline Ogle (1917-2004) was born on May 4, 1917 in Pitcairn. On Oct. 20, 1950, the 23-year-old Faith married Joseph Stephen Hartman (March 19, 1914-1988), a native of Indiana. The couple divorced in 1957. Joseph spent his final years in San Diego, where he passed away on Aug. 19, 1988. Faith made her home in Sun City, CA and died there on Aug. 30, 2004. Daughter Ruth Erma Ogle (1918-2012) was born on May 30, 1918 in Pitcairn. She attended business school in Pittsburgh and later served during World War II as a corporal and weather observer in the U.S. Army Air Force, as well as a surgical technician for the 123rd Infantry in the Pacific Theatre. In about 1947, Ruth married Robert Woodson Humphrey (Nov. 27, 1919-2012), a native of Akron, OH and the son of Denny and Della (Woodson) Humphrey. They settled in the Escondido suburb of San Diego, CA and produced two children -- Renee Humphrey and Robert Woodson Humphrey II. Ruth died in Escondido on June 21, 2012, ending a marriage of 65 years' duration. She was laid to rest in Escondido's Oak Hill Memorial Park, with an obituary printed in the San Diego Union-Tribune. Robert only lived for another six months after Ruth's death. He joined her in eternity on Dec. 14, 2012. Burial was in Oak Hill Memorial Park in Escondido, with an obituary also published in the Union-Tribune. Their daughter Renee has provided valuable information for this biography. Daughter Vera Dawn Ogle (1919-2008) was born on Christmas Day 1919 in Pitcairn. At the age of 45, on Nov. 2, 1964, she was united in holy matrimony with Edmund Raymond Brown (Oct. 14, 1923-2000). They lived for many years in Saratoga Springs, NY. Edmund died in Queensbury, NY on Feb. 7, 2000. Vera survived him by eight years and passed away in Saratoga Springs on Sept. 14, 2008. Daughter Bonnie Lovelle Ogle (1921-2009) was born on June 2, 1921 in Pitcairn. During World War II, she served in the Women's Army Corps (WAC) in 1943-1945. On May 22, 1948, the 27-year-old Bonnie was joined in wedlock with 25-year-old Lawrence Edward Happ (Nov. 29, 1922-1963), a native of Grant, OK. The couple went on to produce four children. Sadly, Lawrence died in Oklahoma City on Dec. 22, 1963 at the age of 41. Bonnie lived for another 46 years after her spouse's untimely death. Circa 2005, she resided in Yountville, CA. She succumbed in Chula Vista, CA on Nov. 8, 2009. Daughter Mary Lucretia Ogle (1923-2005) was born on May 14, 1923 in Pitcairn. She married William J. Whalen (Aug. 8, 1923-1997) on June 24, 1948, when she was age 25 and he 24. William was a native of Wilkinsburg near Pittsburgh. They resided in Monroeville, PA and Myrtle Beach, SC. Their children were Diana Lee Hornyak and Patricia Ann Dekret. They were members of the First Presbyterian Church of Myrtle Beach. William succumbed on Dec. 18, 1997, at the age of 74. Burial was in Grandview Cemetery in North Versailles, PA. On April 30, 2005, Mary passed away at the age of 81 in the Grand Strand Regional Medical Center. An obituary was printed in the Pittsburgh Post-Gazette. Granddaughter Diana Lee Whalen married (?) Hornyak and dwelled in Sewickley, PA in 2005. Granddaughter Patricia Ann Whalen wedded (?) Dekret. In 2005, their home was in Pittsburgh. Daughter Ida Mae Ogle (1893-1962) was born in May 1893 in Pitcairn. At the age of about 24 or 25, in 1918, she wedded Lawrence Lyman McDowell (Jan. 14, 1891-1952), a native of Ligonier, Westmoreland County. He stood 6 feet tall, weighed 180 lbs and had auburn hair and blue eyes. The couple produced one son, Robert Johnston McDowell. When the federal census enumeration was made in 1920, the McDowells rented a home at 765 Sixth Street Extension in Pitcairn, and Lawrence was employed as a railroad brakeman. Living under their roof were Ida Mae's aged grandparents, John F. and Mary (Rice) Flack. During the 1920s, Lawrence apparently was transferred to Canton, Stark County, OH, and the 1930 U.S. Census shows him continuing to work as a railroad brakeman, with the family owning the house in which they lived. Sadly, the McDowells divorced during the 1930s. Lawrence relocated to Detroit and found work with Humanity Pub Company. He passed away from heart problems in Detroit at the age of 61 on Nov. 6, 1952. Ida Mae dwelled with her son in Canton. She succumbed at the age of 68 in Canton's Aultman Hospital on Feb. 21, 1962. Son Robert Johnston McDowell (1919-1989) was born on June 3, 1919 in Pitcairn. He never married. He stood 6 ft., 4 inches tall, weighed 175 lbs., and had brown hair and blue eyes. At one point he earned a living as a janitor. In 1940, he made his home at 552 Dixon Street in Homestead, near Pittsburgh, where he was a newspaper distributor, but also maintained a residence at 1007 Lawrence Road in northeast Canton, Stark County, OH. Robert died at the age of 69 in Canton on May 12, 1989. Son Chalmer Trustin Ogle (1895-1976) was born on Dec. 9, 1895 in Pitcairn. He stood 5 ft., 7 inches tall and weighed 140 lbs., with grey eyes and blonde/brown hair. At the age of 21, Chalmer made his home on Hillside Avenue in Pitcairn, and was employed as a locomotive fireman by the Pennsylvania Railroad at its Pitcairn yard. He registered for the military draft in June 1917 as World War I was enflaming Europe. He joined the U.S. Army on Oct. 18, 1917, with the news published in the Pittsburgh Daily Post. He initially trained at the Columbus Army Barracks and at Kelly Field in San Antonio, TX. Then, on Nov. 10, 1917, he was assigned to the 147th Aero Squadron and was sent to New York for transport to Europe. After arriving in France, he and his unit were engaged in action at the Toul Sector, Champagne-Meuse, Aisne-Marne, Oise-Aisne, St. Mihiel, Verdun and Meuse-Argonne. Chalmer eventually became an army chauffeur. He may have been exposed to enemy mustard gas that needs to be confirmed. After the war's end, on March 6, 1919, he and the 147th Aero Squadron shipped out from Brest, France aboard the U.S.S. Charleston bound for New York and an honorable discharge. The Pennsylvania Railroad rehired Chalmer after his arrival home. On Nov. 25, 1921, the 26-year-old Chalmer eloped to West Virginia to marry 21-year-old Bernice Naomi Yothers (March 30, 1902- ? ). The ceremony was held in Wellsburg, Brooke County, WV by the hand of Rev. P.E. Burtt. She was the daughter of Oscar and Mary (Donahue) Yothers of Coupon, Cambria County, PA. They were the parents of Wilford Leeland Ogle, Boyd Chalmer Ogle, Barbara Arlene Warner, George Ewing Ogle, Maxine Stewart and Stuart Franklin Ogle. Sadly, they lost a stillborn son on April 30, 1943 in Braddock Hospital. Chalmer lived on Hillside Avenue in Pitcairn circa 1939 and joined the U.S. Post Office in Pitcairn in the 1920s, remaining as a post office clerk through the late 1940s. He enjoyed smoking a pipe. At the age of 60, Chalmer and the family relocated to Fort Lauderdale, Broward County, FL. They became members of Saint Andrew's United Methodist Church. Their address in 1974 was 5501 NE 51st Street and in 1975-1976 was 151 NE 55th Street. Chalmer died suddenly while in Denver, CO on Aug. 10, 1976, at the age of 81. Rev. Ralph Johnston of the family church, assisted by Chalmer's son Rev. George Ewing Ogle, officiated at the funeral service. Burial was in Forest Lawn Memorial Gardens in Pompano Beach, and an obituary was printed in the Fort Lauderdale News. Bernice spent seven years as a widow in Fort Lauderdale. She joined her husband in eternity on Feb. 15, 1983. Son Wilford Leeland Ogle (1922-1984) was born on Oct. 24, 1922 in Pitcairn. He wedded Arlene Beth Malish (1926-living). The Ogles relocated to Allen County, IN, making their home in or near Monroeville, an outlying community near Fort Wayne. Wilford passed away in Monroeville on May 25, 1984. Son Boyd Chalmer Ogle (1924-2006) was born on May 23, 1924 in Pitcairn. He married Eileen McMullen (1928-living). They produced three children -- Patrick Ogle, Connie Ogle and Jennifer Edwards. He was an airplane mechanic during World War II, working on B-24 liberator aircraft. He was an English teacher and journalism advisor for more than three decades in Stranahan High School in Sunrise, Broward County, FL, retiring in 1992. Said the Orlando Sun-Sentinel, he also enjoyed "creating metal sculptures, which he dubbed 'totem poles'," and enjoyed gardening and watercolor painting. Many of his artworks were of scenes in Pitcairn. After enduring Alzheimer's Disease for three years, Boyd died at the age of 81 on April 25, 2006, at North Broward Medical Center in Fort Lauderdale. Grandson Patrick Ogle was a reporter for the Miami Herald. Granddaughter Connie Ogle also was a Miami Herald reporter as a book and film critic. Daughter Barbara Arlene Ogle (1926-2004) was born on Aug. 27, 1926 in Pitcairn. On May 7, 1948, at the age of 21, she married 20-year-old Kenneth Eugene Warner (1927-1979), son of Marshall and Evelyn (Curry) Warner of Pitcairn. At the time, she was employed as a production clerk at the Westinghouse Air Brake Company, and resided on Hillside Avenue in Pitcairn, and he was a fireman with the Pennsylvania Railroad. They established a home in Denver, CO. Barbara died on Feb. 13, 2004 in Denver. Son Dr. George Ewing Ogle (1929- ? ) was born on Jan. 7, 1929 in Pitcairn. Perhaps inspired by the helplessness of his family's tragedies in the coal industry, he spent his career as Christian ministry advocating for social justice -- including writing books about political oppression in South Korea and coal miners' perspectives in Colorado. He married Dorothy Lindman ( ? - ? ) in 1959, when he was age 30. He received a bachelor of arts degree from Maryville College in 1951, a bachelor of divinity degree from Duke University in 1954 and a master of science and Ph.D. degree in 1966 from the University of Wisconsin. Ordained as a clergyman in the Evangelical United Brethren Church, George served as a missionary in South Korea for two decades, focusing his efforts on the lives of factory laborers in the city of Inchun. He taught industrial relations at the University of Seoul in 1973-1974. While the family stayed behind in Korea by choice, after 20 years of service, George was expelled in December 1974 after criticizing President Chung Hee Park. The news was published, among other publications, in the Fort Lauderdale News and the Uniontown (PA) Evening Standard. The family eventually made a new home in Decatur, GA. Upon retirement, they relocated to Lafayette, CO. He has authored several books, among them Liberty to the Captives: The Struggle Against Oppression in South Korea (1977); South Korea: Dissent Within the Economic Miracle (1991); How Long O Lord: Stories of Twentieth Century Korea (2002); The Price of Colorado Coal: A Tale of Ludlow and Columbine (2006); Cherry Blossom Comrades: A Story of Japanese Immigrants in Colorado Coalfields (2008); Stories from the Colorado Coal Mines; Rocky Road to Justice (2011); and Our Lives in Korea and Korea in Our Lives (2012). Deeply interested in parting the curtain obscuring his tangled family roots, and the change of name from "Ingles" to "Ogle," he wrote The Mystery of Jacob Engles, in which he "weaves a moving tale, accounting for the missing years..." His papers, comprising 5.8 cubic feet, are housed for perpetuity in the Archives and Manuscripts Department of Pitts Theological Library at Emory University. He was profiled in Duke Magazine in July-August 2003. Daughter Maxine Ogle (1930- ? ) was born on March 1, 1930. She was united in matrimony with (?) Stewart ( ? - ? ). The Stewarts made their home in Fontana, CA in 1976. Son Stuart Franklin Ogle (1931-1995) was born on Sept. 7, 1931 in Pitcairn. On May 2, 1959, at the age of 27, he was joined in wedlock with Betty Swindell ( ? - ? ). They resided in Dunblin, CA in 1974 and later moved to Grays Harbor County, WA. Stuart passed into eternity on Oct. 13, 1995 in Grays Harbor. Son Albert Franklin "Happy" Ogle (1900-1966) was born on Jan. 11, 1899 in Pitcairn. He completed the seventh grade in school. As an adult, he was tall and slender, with light hair and brown eyes. At the age of 19 in 1920, unmarried, Albert was employed by the Pennsylvania Railroad's Pitcairn yards as a car repairman. In April 1929, he and his friends Maria Rice and Mary Duncan traveled to Iron Bridge, near Mt. Pleasant, to visit with Mrs. Rice's brother in law Amzi Rice. The event was chronicled in the gossip column of the Connellsville Daily Courier. Circa 1930, he worked as a laborer for an oxygen plant in or around Pitcairn. At the age of 33, on Sept. 2, 1932, Albert was united in holy matrimony with 17-year-old Sara Elizabeth Fillmore (Dec. 11, 1914- ? ). She was a native of Delmont, PA and the daughter of John and Nellie (Remaley) Fillmore. At the time of marriage, both were residents of Hillside Avenue in Pitcairn. With the nation in the grip of the Great Depression, and jobs hard to come by, the Ogles relocated in about 1937 to Niagara Falls, NY. Over the span of a few years, their addresses changed from 132 82st Street to 8754 Buffalo Avenue to 358 71st Street. There, Albert was employed as a machine operator in another oxygen production facility, National Cylinder Gas Company of Buffalo. By 1949, he took another position as chemical operator with B.F. Goodrich Company in New York. They remained in their Niagara Falls residence until the early 1960s, when they moved to Southern California, making a new home in Orange County, CA. Albert died in Anaheim at the age of 67 on Jan. 23, 1966. Sara remained a widow for three years and then wed again on Nov. 22, 1969 to August Yegon Zeller (1897-1984). Sara spent her final years in Newport Beach, CA. She passed away there two days before Christmas 1986. Son Ronald Franklin "Ron" Ogle (1933- ? ) was born in 1933 in Pitcairn. He served in the U.S. Navy during the Korean War, from about 1952 to 1955. Daughter Roberta Irene Ogle (1935-1980) was born on April 16, 1935 in Wilkinsburg near Pittsburgh. On July 18, 1969, she was wedded to Merle Kenneth "Ken" Steffen (March 25, 1936-2017), son of Emil and Elizabeth (Weber) Steffen of Hartford, WI. Merle served in the U.S. Navy. He later worked as a police officer in Colton, CA and headed the detective division, with emphasis on narcotics. Later, he became chief of police. Sadly, Roberta died on March 21, 1980 in Riverside, CA at the age of 45. Merle outlived his wife by 37 years and married again to Katherine "Kay" Ernst ( ? - ? ). They are believed to have produced a daughter, Kristen Alford. After he retired, he owned a private investigation firm and worked at the Meeks Building Center guard shack in Harrison, AR. He enjoyed polka dancing, German music and a "good steak," said an obituary. He succumbed in Harrison at the age of 80 on Jan. 15, 2017. Son John Trustin Ogle (1938- ? ) was born in 1938 in Niagara Falls, NY. Daughter Mary "Ruth" Ogle (1902-1973) was born on Sept. 27, 1902 in the family home on Ninth Street in Pitcairn. She completed an eighth grade education. At the age of 20, on June 19, 1923, Ruth eloped to West Virginia to wed 20-year-old Emery Andrew Miller (Dec. 14, 1902- ? ). The ceremony was held in Wellsburg, Brooke County, with Rev. E.E. von Pachy officiating. Emery also was a native of Pitcairn and the son of Elmer Lincoln and Alice May (Grove) Miller. The Millers produced these children -- Elaine Morrison, Elmer G. Miller, William Lawson Miller, John O. Miller, Charles D. Miller and Ronald K. Miller. Emery was a high school graduate and learned the largely self-taught arts of gold leaf, lettering and sign painting through the International Correspondence School of Scranton, PA. In the early years of his working career, from 1918 to 1928, he was employed in the Pitcairn yards of the Pennsylvania Railroad as a laborer, clerk, truck driver and fireman. he stood 5 feet, 9 inches tall and weighed 165 lbs., with blue-grey eyes and brown hair. The family relocated to Cleveland, OH in September 1928, with Emery employed as a railroad brakeman and yardman and Ruth as a clerk at the local 5 & 10 store. They roomed at 5915 Quimby Avenue. Then withina month after the stock market crash of 1929, Emery was furloughed from the railroad. He never was rehired, and they returned to Pitcairn in about August 1930, living under his parents' roof. During the Great Depression, Ernest never was steadily employed but worked when needs arose. He found a painting job at the sprawling Westinghouse plant in East Pittsburgh and the Millers moved into their own home at 548 Broadway in Pitcairn. By 1940, they relocated again to 900 Elm Street. They continued to change addresses often, to 625 Kelly Avenue in Wilkinsburg until 1953, and thence to a duplex at 1429 Summit Street in Wilkinsburg until 1955. They purchased a duplex unit in Forest Hills in May 1955, at 318 Avenue A, with their son and daughter in law William and Myrtle Miller living in the other unit. When World War II erupted, Emery left Westinghouse and joined the U.S. Navy in Pittsburgh on May 18, 1943. Utilizing his skill, he served as a painter second class, applying paints and varnishes to Navy equipment as part of the 102nd Naval Construction Battalion. His unit was stationed in the South Pacific for 16 months in New Guinea and the Philippines, from Feb. 22, 1944 to July 20, 1945. During his time in New Guinea, he contracted malaria and jungle rot and, after returning to California, was treated in a Naval Hospital in Astoria, OR for several months until his discharge in Bremerton, WA on April 13, 1946. Upon his return to Wilkinsburg, Emery tried to rejoin Westinghouse, thinking a job would be guaranteed, only to be told he had quit before the war and was not entitled to a position. He then found employment with oil companies locally until 1949, when a kindly former boss hired him to work at Westinghouse's newly opened Bettis Atomic Power Laboratory in West Mifflin. The plant was engaged in development of nuclear-powered Navy warships. Emery worked at Bettis until his death in 1967. Emery moonlighted as a sign painter and specialized in application of gold leaf. It's said that he brushed the leaf in his hair to create static so that it could be removed if needed when placed on a sign. In 1966, Emery was diagnosed with lung cancer and was given a year to live. He died at home at the age of 64 on Nov. 10, 1967. Interment was in Sunset View (Riverview) Memorial Cemetery in Penn Hills. Ruth survived her husband by seven years. Not feeling well in January 1973, she went to Presbyterian Hospital in the Oakland section of Pittsburgh, and never left. The cause of her symptoms never was diagnosed. She suffered for a month and passed away at the age of about 69 or 70 on Feb. 7, 1973. A death notice in the Pittsburgh Post-Gazette noted that she was survived by 19 grandchildren and six great-grandchildren. An autopsy revealed that she had been afflicted with Creutzfelt-Jakob, otherwise known as "Mad Cow's Disease" which is a very rare disorder of the brain, affecting about one in a million people every year around the world. According to research by Ian and Alyssa Kelley, Emery and Ruth had produced an astonishing 140 descendants as of 2017, including six children, 24 grandchildren, 53 great-grandchildren, 54 great-great grandchildren and three great-great-great grandchildren. Son Elmer George Miller (1924-1994) was born on Feb. 7, 1924 in the family home on Hillside Avenue in Pitcairn. When he was age 19, Elmer enlisted in the U.S. Army on March 9, 1943, and ultimately saw military service in France and Germany in 1945 under the command of Gen. George S. Patton. Before shipping out, in a ceremony held in New Hanover, NC on July 23, 1944, George wedded Anna Mae McMullen (Dec. 31, 1924-1989), daughter of Joseph and Hazel (Pemberton) Mullen. After the war's end, he was discharged at Camp Shelby, MS on Oct. 25, 1945. He returned home to his wife, and they established a home initially in Wilmerding, Allegheny County, and later moved to Pitcairn and eventually to Wilkinsburg. Elmer earned a living as a streetcar driver and later as a bus driver. In 1963, the Millers relocated to Plum Borough. In about 1975, with Anna Mae suffering from emphysema, they relocated to Florida. Sadly, she died from her ailment on March 6, 1989 in Sarasota at age 64. Elmer outlived his bride by almost five years. He succumbed to a heart attack at age 69 on Jan. 23, 1994. Son William "Lawson" "Willy" Miller (1926- ? ) was born on July 1, 1926, in Pitcairn. He was employed at the age of 22 as a machine operator in the Wilkinsburg area. With World War II raging, he joined the U.S. Navy in 1943. He participated in the invasion of Normandy in June 1944. He received his honorable discharge on April 6, 1946 in Bainbridge, MD. He returned home and obtained employment with St. Regis Paper, where he worked until retirement in 1983. On Sept. 17, 1948, at the age of 22, he married 18-year-old clerk Myrtle J. Jones (Nov. 8, 1929-2006), the daughter of Clifford and Dora (Wheeler) Jones and a native of North Bessemer, PA. The ceremony was held at Christ Evangelical United Brethren Church of Wilkinsburg, and officiated by Rev. Harry J. Fisher. At the time of marriage, Myrtle made her home at 1116 North Murtland Avenue in Pittsburgh. They were the parents of three sons -- William E. Miller, Gary L. Miller and David M. MillerAfter their marriage, Lawson and Myrtle resided in Wilkinsburg until in 1955, they bought a unit in a duplex in Forest Hills, with his parents owning the other unit. In 1984, the couple relocated to Apollo, Armstrong County, PA. Sadly, Myrtle died from a heart attack at age 76 on March 6, 2006. Burial was in Riverview Memorial Park. An obituary in the Valley News Dispatch noted that she was survived by 13 grandchildren and 14 great-grandchildren. Lawson still lives in the Apollo area. Grandson William E. Miller married Chris. Grandson Gary L. Miller wedded Cindy. Grandson David M. Miller was joined in matrimony with Jean. Son John Otis Miller (1932-1986) was born on Feb. 24, 1932 in Pitcairn. On Sept. 27, 1952, he was united in marriage to Swissvale native Marjorie Brandt (1931- ? ) in Homestead Park, PA. John was a longtime employee of Bell Telephone. He and Marge dwelled in the Penn Hills area, but they divorced in 1980. Six years later, while visiting a friend in Florida, John suffered a massive heart attack and was then hospitalized. Arrangements were made for him to be flown to Pennsylvania to be treated by physicians in Pittsburgh. Just prior to his flight, however, fate intervened when John died on Aug. 29, 1986 at age 54 in Fort Lauderdale. Son Charles Dale "Chuck" Miller (1934- ? ) was born in 1934 in Pitcairn. At the age of 18, in 1952, he married Lois Lasich (1932- ? ) of Wilkinsburg. In about 1965, Chuck and Lois moved to Plum Borough, where they live to this day. Chuck was a welder and had his own painting business on the side. Daughter Lois "Elaine" Miller (1939-2005) was born on Oct. 26, 1939 in Pitcairn. On May 27, 1960, when she was 20 years old, Elaine married William John Morrison ( ? - ? ) in a ceremony held in Wilkinsburg, PA. Elaine was granted a divorce from her husband on Feb. 16, 1973. Almost two years later, she wedded John Frederick "Jack" Gross (June 30, 1928-1999) in Wilkinsburg on Dec. 28, 1974. A native of Wilkinsburg, he was the son of Frederick and Rose (Good) Gross. Combining both marriages, Elaine was the mother of Pamela Grabowski, John F. Gross Jr, Anthony W. Gross, Robert T. Gross, Keith D. Morrison and Rebekke R. Kowalski. Jack served as borough manager of Edgewood, near Pittsburgh, from 1955 to 1980, and Elaine Gross worked at a bank. They resided in Forest Hills, PA. He died from cancer at age 70 on April 12, 1999, while Elaine passed away from breast cancer on April 5, 2005. The Pittsburgh Post-Gazette printed a death notice, suggesting that any memorial contributions be made to the American Cancer Society Relay for Life. Granddaughter Pamela married (?) Grabowski. Grandson John Frederick Gross Jr.
Granddaughter Rebekke R. wedded (?) Kowalski. Son Ronald Keith "Ron" Miller (1942- ? ) was born in 1942 in Wilkinsburg. He married Valerie Ann "Val" Mafrice (1946- ? ) in 1969, the daughter of Louis and Chesteria (Dziubinski) Mafrice. Ron and Val lived in Wilkinsburg until moving to Plum Borough in 1972. Ron served in the Pennsylvania National Guard from 1965 to 1971, and during the Pittsburgh race riots in 1968. He was employed as a computer operator at Westinghouse Electric's East Pittsburgh Plant from 1967 until it closed in 1988. Daughter Myrtle Ogle (1906- ? ) was born in about 1906 in Pitcairn. She married Richard O. Stamford ( ? -1989), often misspelled "Stanford," an immigrant from England. They bore five known children -- Dona R. Long, Sandra Close, Charles Stamford, Donald Stamford and Thomas Stamford. They resided in Turtle Creek, Allegheny County, at the address of 143 D, Watson Drive. Later, by 1976, they moved to Greensburg, Westmoreland County, PA.
Richard was employed as an inspector circa 1950. By the late 1980s, their home was in Levelgreen, near Pittsburgh. Richard passed away on Oct. 12, 1989. A death notice in the Pittsburgh Post-Gazette noted that he was survived by 11 grandchildren, eight great-grandchildren and his siblings Vera Sparr, Eric Stamford and Thomas Stamford. Daughter Dona R. Stamford (1928- ? ) was born on July 15, 1928. At the age of 21, residing at home, she married 27-year-old Eugene P. Long (1922- ? ). He was the son of Patrick J. and Elizabeth (Conroy) Long of Turtle Creek, and at the time was a salesman living in the Davidson Building in Charleston, Kanawha County, WV. The wedding took place on April 28, 1950, in Turtle Creek, by the hand of Rev. C.A. Thomas. Daughter Sandra Stamford ( ? - ? ) wedded (?) Close ( ? - ? ). Son Clarence Otis Ogle (1908-1980) was born on Sept. 11, 1908 in Pitcairn. His middle name also has been spelled "Otice." He married Josephine Toocheck (1914-2007), the daughter of John and Josephine (Gorcak) Toocheck. They resided in Pitcairn and Trafford, Allegheny County, and produced three children: John E. Ogle, William O. Ogle and Bonnie E. Craig. By 1976, the Ogles relocated to Irwin, Westmoreland County, PA.
Clarence passed away at the age of 71 in January 1980, in Greensburg, Westmoreland County. In her final illness, Josephine resided at the William Penn Care Center in Penn Township, Allegheny County. She died there at the age of 92 on Jan. 31, 2007. No funeral service was held. At her death, the Greensburg Tribune-Review reported that she was survived by five grandchildren, nine great-grandchildren and two great-great grandchildren. Daughter Bonnie E. Ogle married (?) Craig. Renee Humphrey and Alyssa and Ian Kelley have contributed valuable details for this biography.